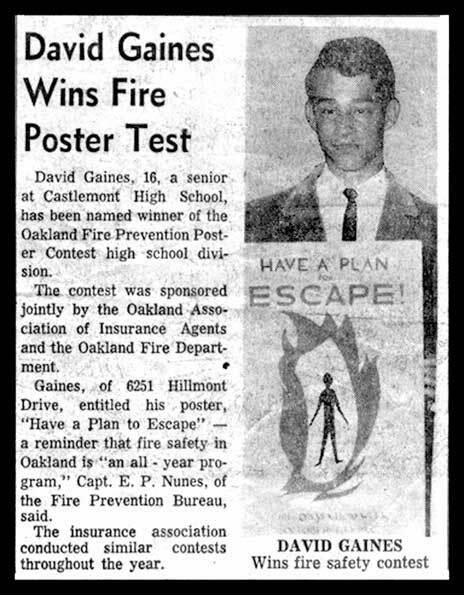 In 1962, when I was a Junior at Castlemont high school, I entered an Oakland Mayor's competition for a fire safety poster, and was selected as the winner. I received a $25 United States Savings Bond, and got my name and photo in the Oakland Tribune. My name was spelled wrong, my grade level was wrong, the headline was confusing and the savings bond got lost, but the thrill of recognition of my fledgling effort was not dimmed. It was the first time that I'd received anything beyond the approval of parents, peers or teachers. People who did not know me saw my name in print and became aware of my artistic capacity. It was a pretty big deal. You never know where talent is going to take young folks. There's not too much you can do to encourage it. Sometimes it seems like there's nothing that doesn't produce the contrary of what you want. But it's surprising how even the most blasé teenager secretly thrills to real recognition, You can catch more flies with honey than with vinegar, as my great-grandmother often said.